My parents entertained frequently while I was growing up. Since it was still considered exotic at the time (at least in the suburbs of Chicago), their dinner parties usually featured Japanese food. However, Oshogatsu, or New Years Day, was always the most important and lavish event, one which our circle of close friends anticipated for the entire year. While I'm always quick to point out that everyday Japanese food is simple and easy to make, festival food is another story. Therefore, over the years, as my parents aged and couldn’t keep up with the sheer physical strain of the preparations, the parties became not annual events, but a sporadic, on-again, off-again affair. So it was that three years ago, I offered take over as head chef for the annual New Year’s party. Based on my experience with whipping up meals on the go, I figured it would be quite easy. Boy, was I wrong! The whole process (while loads of fun) took two whole days, and by the end of each day my legs were tired from standing. How did my parents manage to keep up this tradition for all these years? What takes so long? Well, the Japanese believe that New Years is the time to start afresh. Old debts are paid off, arguments are settled, and the whole house is given a good cleaning. Just like other people around the world, we reflect on the past year and resolve to become better human beings in the New Year. This extends to our spiritual life as well. In order to truly start the year in the most positive and pure way possible, all housework and cooking is to be finished by December 31, so that January 1st can be spent enjoying time with family and friends. All but the most vital shops close from December 28 to January 3rd. So, as you can imagine, it takes quite a bit of work and planning to keep a well stocked table. This type of New Years cuisine even has its own name; Osechi-ryori. Osechi ryori is a traditional style of cooking based on ancient methods of preserving food, such as curing in salt or vinegar, or simmering in sweetened soy sauce and sake. 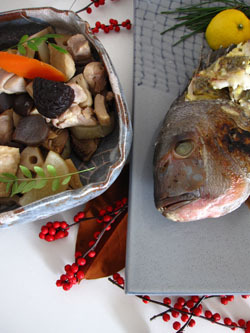 In osechi-ryori, vegetables predominate, as well as grilled fish such as tai (sea bream) and buri. All are prepared to be eaten at room temperature, and can be kept for several days without refrigeration. These morsels are tightly packed into exquisite lacquer boxes called jubako. 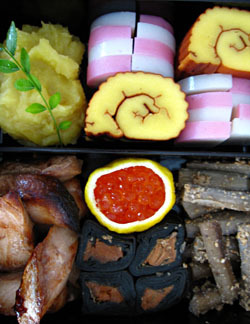 Care is taken to include lucky colors, such as brightly colored pink and white kamaboko (fish cakes) and kohaku namasu (red and white salad), as well foods with symolic meaning such as kazunoko (herring roe, literally meaning “many children”), renkon, (lotus root; a Buddhist symbol) and sweet kuromame (black beans, again, for fertility), tai (sea bream, the last syllable of the word for celebratory: omedeTAI. Modern times leave little time for such eleborate cooking, and it's no wonder that these days, many Japanese buy ready-made osechi-ryori from the better kaiseki restaurants. These marvelous boxed meals, like super-gourmet bento, can be ordered ahead of time and arrive in lacquered, wooden, or plastic boxes, depending on the price. These can be as high as $3,000 from such famous restaurants such as Kitcho in Kyoto, but even the most modest variety costs around $300. My humble attempt came to around $300 as well, and was enough for 20 people, with leftovers. And I would have to say that while the whole process was fun, the most enjoyable part was arranging the colorful morsels in jubako and on platters for family & friends. It was a great party, and my parents enjoyed a well-deserved break. Since then, whenever I offer to make osechi-ryori again (usually sometime in October), my mother's eyes grow wide and she says incredulously, "really?" Her delighted expression makes all the trouble worthwhile. Left to right, top to bottom: kurikinton, kamaboko and datemaki, roasted buri, ikura in yuzu rind, kombumaki and tataki gobo. More complicated osechi dishes: Iridori and tai (sea bream) glazed with uni (sea urchin) sauce. OSECHI AT HOME: The recipes below are typical osechi dishes that can be prepared by anyone with access to a Japanese market. 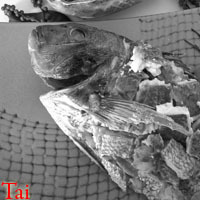 Tai with uni glaze: Tai is synomymous with calebratory. 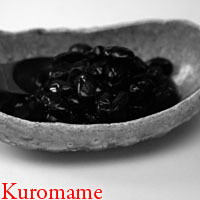 Kuromame: Slow-simmered sweet soybeans symbolize fertility. 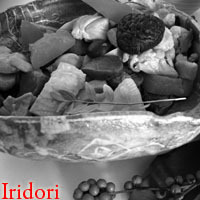 Iridori: The name simply means "chicken in it", but the dish is savory, substantial and a classic example of osechi-ryori. 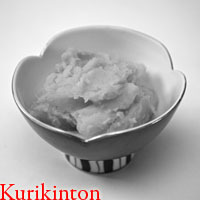 Kurikinton: Candied chestnuts and sweet potato; colored gold, the symbol of wealth. 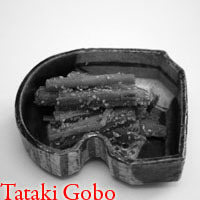 Tataki Gobo: Burdock's deep roots symbolize stability. Split ends multiply good fortune. 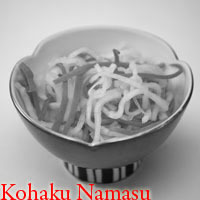 Kohaku namasu: Carrot and daikon salad in red and white, an auspicious color combination. 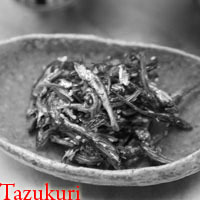 Tazukuri: Dried sardines symbolize a bountiful harvest. Sardines were once used as fertilizer. 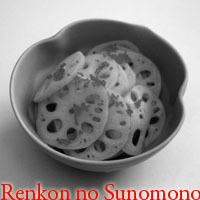 Renkon: Lotus root is a symbol of Buddhism. 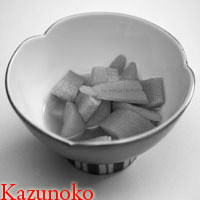 Kazunoko: A symbol of fertility; each herring ovary can contain as many as 10,000 eggs.